1. a path of conduction from an electrical circuit to the earth. 2. to connect an electrical circuit or electrical equipment to the earth. 1 (in electricity) a connection between the electric circuit and the ground, which becomes a part of the circuit. 2 (in psychology) the background of a visual field that can enhance or inhibit the ability of a patient to focus on an object. 1. Basic substance or foundation. 2. Reduced to a powder; pulverized. 3. In electronics, the negative or earth pole that has zero electrical potential. A part or pattern in the visual field which has the perceptual attribute of completeness and is perceived as distinct from the rest of the field which forms the ground. Example: a printed word against a background page. ambiguous figure An image or drawing arranged in such a way that its perception oscillates or flips involuntarily between, usually, two interpretations even though the retinal image remains constant, thus indicating that higher cortical processing are involved. Syn. reversible figure. See Blivet figure; Kanizsa figure; illusion; Necker cube; Rubin's vase; Schroeder's staircase. Blivet figure An 'impossible' figure in which three apparently solid tubes are attached at one end of a rectangular base which projects only two bars (Fig. F4). See Necker cube; Schroeder's staircase; Rubin's vase. fortification figure See scintillating scotoma. 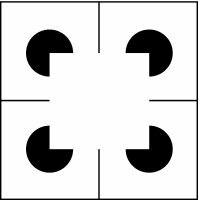 Kanizsa figure An ambiguous figure in which the illusory contour of a square (or triangle) appears in the middle of four (or three) truncated solid squares (or circles). It is an illustration of the perceptual ability to make sense of an incomplete figure by creating a 'whole' image from the separate elements (Gestalt organization). Some people cannot perceive the contour. Syn. Kanizsa square (Fig. F5).reversible f. See ambiguous figure.